Some couples boast having a song that they share in celebrating their relationship. For my boyfriend and me, we prefer to celebrate our relationship with "our food". What food, so romantic, could embody our love you ask? Chocolate covered strawberries? Oysters? No. Ramen. Yes ramen. I admit it's an odd choice but my other half isn't really much of a foodie and the only thing that seems to have sparked his interest in my constant search for new food to try is ramen. As they say, relationships are a series of compromises and if it means I get him to show a bit of excitement for my obsession for food I'll take it. So we've made a point to try all the ramen joints we can get to. Thus far we've been lucky enough to sample delicious bowls of hot soup and noodles from Sydney to Melbourne. The joint fit to kick off this first review would have to be this little gem: Mr Ramen San. This bowl of goodness won both our hearts almost immediately. The tonkotsu soup, a broth rendered from pork bones, provided the perfect base for the noodles. Honestly the soup alone warrants repeat visits from the boyfriend and I. The moreish broth, flavoured with a dash of black sesame oil, was creamy, flavoursome (without being overly salty) and comforting. It nestled a bundle of noodles, thicker than the likes of Ippudo, but cooked perfectly to avoid doughiness and retain bite. The generous cuts of tender charshu pork was succulent and not overly fatty. 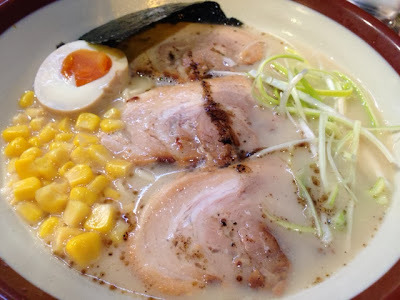 Now the ni-tamago, the soft centred egg, done perfectly, added a hum of its own flavour to the ramen, the perfect finishing touch in my opinion. If you must know, the corn and the spring onion neither added or detracted from the dish. This little gem impressed my boyfriend so much, he gave his compliments when paying, which ensued a lengthy conversation with the owner who told him she drank the soup every single day because of its high gelatin content, which is beneficial for your skin and joints (collagen). This definitely gives me an excuse to frequent this joint more often, not that I really needed one. I would definitely recommend Mr Ramen San as an affordable location suitable for a casual lunch or dinner. It is a simple, quint little space that serves up a simple, comforting dish done to perfection.